Bathymetric contours of a submerged chasm in the Willamette River inspire our holiday greeting and message for hope, peace and goodwill throughout the coming year. Thousands of years of water have carved a deep ravine beneath Willamette Falls in Oregon City. Through the pictorial language of contours, the elegance of an intriguing, concealed underwater gorge is graphically revealed. The landform is so deep and shear that the contour lines stack, appearing as two opposing ribbons. Between these ribbons, we explore the intersection of topography and typography. The contours are now altered to divulge a secondary subliminal message about how rivers bring features of our natural world and its people together. Here is a sneak peek at our pro bono design work for the 2015/2016 Season of Third Angle New Music. This contemporary chamber music group launched its 31st season with a performance at the Alvar Aalto designed Mt. Angel Abbey Library on October 3rd and 4th. Next up is the Reich-analia concert on January 30th with special guests Sō Percussion. This season’s program design continues to explore the graphic representation of the intersection of new music, composition and collaboration across the dimensions of style, time and space in which the composers and performers are juxtaposed within the folding planes of a triangular grid. How Can Landscape Architects Affect Positive Change in Homelessness? That’s the question that Carol Mayer-Reed will explore on a panel at the ASLA National Meeting in Chicago on Friday, November 6. “Designing with the Homeless” will explore the role of landscape architects, planners, and designers in addressing homelessness which is experienced by an estimated 650,000 people in America. Join Carol; Randy Hester, FASLA, University of California; Douglas Pardue, University of Georgia; and Katherine Eastman, Student ASLA, Design Workshop, as they examine how design can positively impact the health, well-being, and future prospects of homeless people. 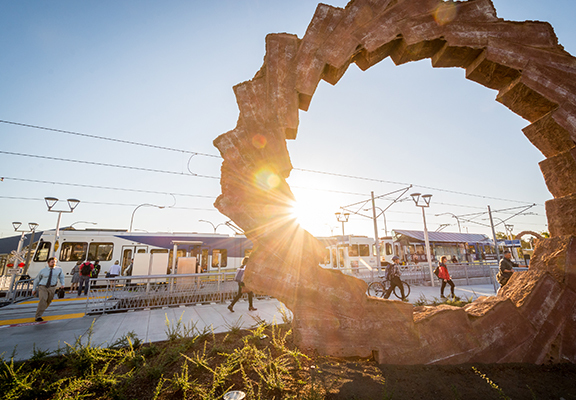 Recognized for setting a new national model for light rail line design, the MAX Orange Line East Segment garnered the ASLA Oregon Chapter 2015 Design Awards top honor, the Award of Excellence. For this transportation infrastructure project, the jury appreciated the role of the landscape architects and a design approach that created a series of human-scaled spaces that weave into the communities. Mayer/Reed, Inc. and GreenWorks, PC, the two firms providing urban design and landscape architecture respectively, submitted the project jointly. ESA Vigil Agrimis provided wetlands and creek restoration on the project. The Orange Line East Segment also received the People’s Choice Award, as selected by attendees of the awards ceremony held on October 23 at the Multnomah Athletic Club in Portland.